Old Providence is in involved in many areas of ministry. As you become a part of the Old Providence, family you are encouraged to find opportunities to learn, to grow, and to serve. Every Sunday at 10:00 am there are Sunday School Classes for all ages. There are classes for children from an infant Nursery through fifth grade. There are classes for Middle School and Senior High youth. The following classes for Adults are held each Sunday: The Men’s Bible Class meets in Providence Hall and is a lecture class for men. 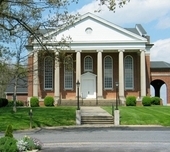 The Ladies Bible Class meets in the Sanctuary Building and is a lecture class for women. The Willing Workers class is a lecture Class for women, which meets in Providence Hall. The Open Door Class is a discussion class for men and women, which also meets in Providence Hall. At various times special interest classes are also provided. Old Providence Women’s Ministries provides opportunities for learning, fellowship and service for all women in the Old Providence family. The group has a monthly meeting on the first Thursday of each month for business and Bible Study. Opportunity is provided for Senior High and Middle School to meet for fellowship, study, and service. Meetings are scheduled typically on the first and third Sundays of each month, September through May. Summer activities are also planned. Our Children’s Fellowship known as “Little Lambs” provides opportunity for children from age three through fifth grade to meet for recreation and study, typically on the first and third Sundays of each month, September through May. Seasonal activities are also planned. Each Summer Old Providence provides a Bible School for the church family and for the community. This Bible School takes place in late June and is intended to be an outreach effort as well a time of learning and worship. It also provides a fun time of recreation and fellowship. On certain Mondays this group meets at 11:00 am for study, fellowship and a light lunch. This program is open to all. Check the church calendar or "Programs and Classes" for the current meeting dates.